Identification: Identification: Halictus individuals are long and dark with bands of pale hair on the outer edge of each abdominal segment, making them appear striped. Many have a subtle metallic green sheen. The females carry pollen on the scopae located on their hind legs. Halictus are similar in look to Lasioglossum, but the abdominal hairs on Lasioglossum are at the base of each segment. 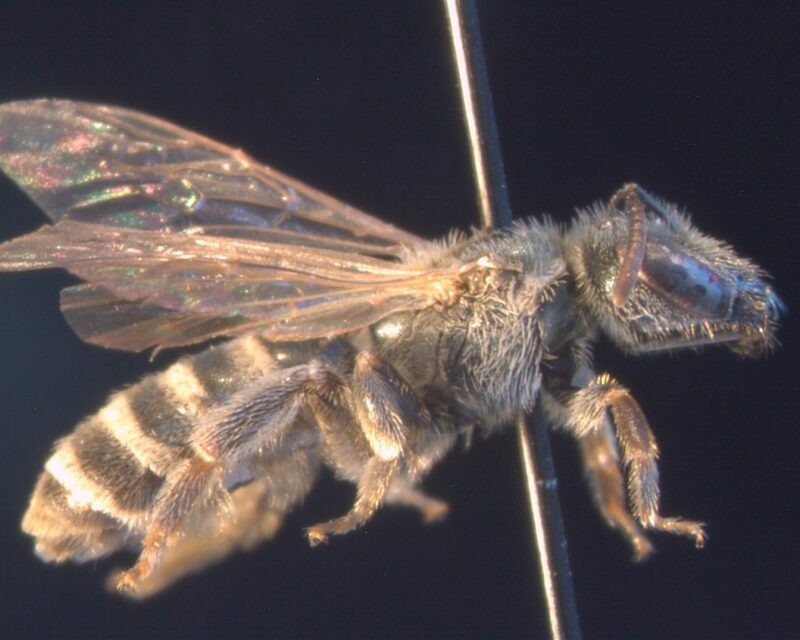 Also, the veins on the outer edges of Lasioglossum wings fade away, and in Halictus they are thick and bold. Halictus can also be confused with Colletes, which have a distinct, heart-shaped face. Foraging Habits: Generalists, and active for long seasons. Nesting Habits: Halictus begin solitary and end eusocial. They nests in flat ground, and prefer sandy loams (soils with loose clay content and high silt content). They line their brood cells with a waxlike material from an organ near the top of the abdomen (Dufour’s gland). The daughters from the first generation remain in the nest and help care for the second generation. Some species of Halictus have small nests with a single queen and a few workers, whereas other have long-lived nests with multiple queens and hundreds of workers.